What I Wore Today: Ready For Battle! I wanted to be as comfy as I could be for what I had to do today...which was go to my cellular phone service provider and complain. BIG TIME! For some undisclosed reason, they cut my line off during the weekend without warning and no explanation at all. All my previous bills have been paid for so it really surprised me when I couldn't make a phone call. Stress! Anyway, I went to their outlet, got really angry, and still had to pay a certain amount so they would re-connect my line. They couldn't tell me why my bill had shot up that much, they couldn't provide a partial billing statement for me to inspect, and they were also quite rude. Actually, just this one customer service rep woman who had a huge chip on her shoulder! I have to wait until my billing next month to find out what went wrong. There is something wrong with this kind of system and I certainly hope they do something about it. On to other things, I read on several health sites that organic eggs differ greatly from their grocery store counterpart when it comes to nutritional values. My husband recently started exercising and is doing recreational weight lifting (hahahahaha!) so he requires extra protein in his diet. Eggs are a popular option to add bulk for muscle builders but the with grocery store bought eggs is that you can't have too many of them. You risk high blood pressure, etc. So , I thought why not try organic eggs. can you taste the difference between organic eggs and non-organic ones? Thank you!I really like your outfit! @hazel: yea sun! same thing happened to you? what happened? nakakainis! I had to pay P2800, dapat P750 lang my regular bill (i have unlimited landline calls), i never go beyond my monthly plan cause it's unlimited nga so there's no reason to.so annoying! hi! i love your bag. can you post details about it? tia! This is very Parisian chic. :) Love the stripes and the wide legs. Great post! this is so simple but yet, so very chic! i LOVE this!! thanks for visiting my blog dear! and im sorry to hear about your cell phone service troubles. i hope everything works out in your favor! first I really have to say this: you're SO pretty! Really:) And second: great outfit! 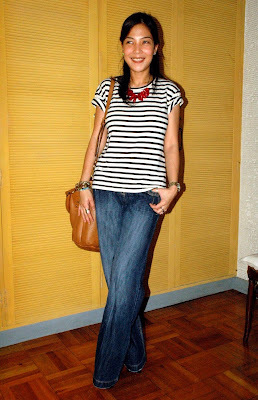 i love simplistic outfits and looks, stipes ect..! hope you visit me back and ,if you like, become a follower! That necklace is adorable! I love the casual chic of the outfit--right up my alley. this is a great laid back look, comfy and cute! Oh I hate it when my cell service goes down just like that! I can understand why you'd get so mad! Good thing you look fab! I love the jeans!!! :) And does the organic egg taste differently from the regular egg? Chic and comfort go hand in hand together in this outfit you put together! So simple and chic! I adore that red coral necklace... just the perfect thing to keep that outfit out of boring-town! I hope your mobile-service dispute went well!